An Antioch teenager’s Sweet 16 birthday won’t be a celebration of excess or even focus on her. Instead, it will be used to help orphans half way across the planet. 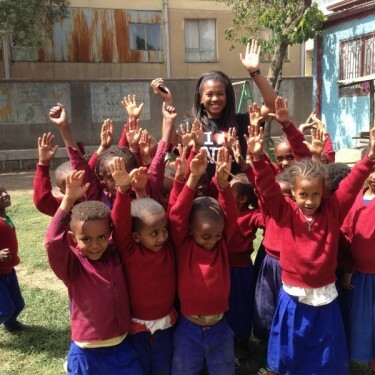 Nubia Wilson decided a birthday party wasn’t the right thing to do, especially after she volunteered in Ethiopia earlier this year, witnessing first hand extreme poverty and seeing children in the streets walking barefoot to school. The school only goes up to fourth grade, so Wilson is trying to add a fifth grade class. The starting point was telling family and friends in December she didn’t want a big birthday party. In lieu of birthday gifts, the 16-year-old sophomore at the all-girl Carondelet High School in Concord asked family and friends for donations and raised $2,000 for The Fregenet Foundation, an Ethiopian-based charity that runs a school for orphaned or impoverished schoolchildren there. But Wilson is far from finished. She is selling Hershey’s bars and is organizing a dinner and auction, with the hopes of meeting a goal of $10,000 to go toward the construction of a fifth grade at the Fregenet School. The school currently has about 300 students–most of whom are orphans — and goes from kindergarten through fourth grade, but doesn’t have the funds to educate children beyond that. Wilson says it feels good to help, but that she has to work harder now to raise more money. 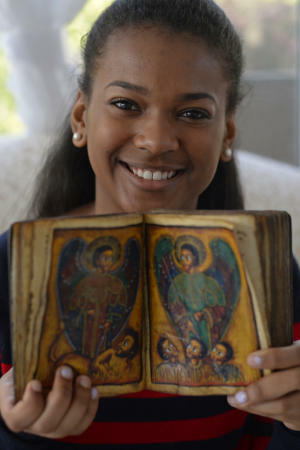 She’s hoping to raise $10,000 and her family is getting involved by letting her auction off some of their Ethiopian art work and artifacts next month. Wilson hopes to hand deliver the money that she raises to the school that’s on the outskirts of the capital this summer. She said she’d like to grow up to be a humanitarian lawyer. Wilson has also started a Crowd Rise page, at www.crowdrise.com/futureforhermela/fundraiser/nubiawilson to assist her fundraising efforts. When she’s not raising funds for charity, she focused on maintaining her status as an honor student and playing basketball at Carondelet, and she hopes to one day attend UCLA or Stanford, with the ultimate goal of one day becoming a lawyer. “I’m just happy to have a house and a bed and a place to sleep, knowing there are so many kids who don’t have anything,” Wilson said. The future is in good hands with young women like this. We just need more like her. Thanks for sharing. Nubia is a very special person and deserving of every praise. Her acts of such great kindness will make an enormous difference to those orphans in Ethiopia. This is an example, not only to the young of today, but to us all. We hear so much of people taking and not of people giving, this is indeed an act to be cheerished. Thank you for stopping by, and a BIGGER thank you for doing such good out there in the world., You are an inspiration to us! Thank you for your continuous support and Happy Thanksgiving to all ‘Kindness Blog’ Family! !